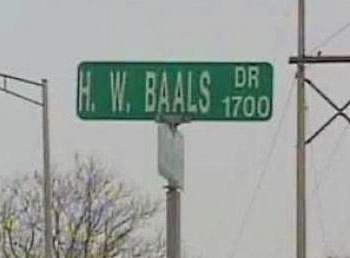 The results of an online contest to name a new government building in Fort Wayne, Indiana, have been scratched after voters overwhelmingly chose to call it the Harry Baals Government Center. When city officials in Fort Wayne decided to build a new downtown "administrative, neighborhood and development hub," they figured there'd be no better, easier way to raise awareness of the new location among the citizenry and get them feeling involved in the process than by having them name it. And the people responded, embracing their civic responsibility with great enthusiasm as they voted overwhelmingly to name the new building the Harry Baals Government Center. Harry Baals was a local politician of considerable repute, serving as mayor of Fort Wayne from 1934 to 1947 and then from 1951 until his death in 1954. He was responsible for opening construction on the city's underground sewage system and the sewage treatment plant that remains in use today, and took an active role in material drives and infrastructure projects during the Second World War. His wife, Minnie Baals, died in 1936. Yet despite that pedigree and the huge amount of love people have for Baals, city officials said they won't name the building after him for fear that it will be subject to ridicule. He may still be honored in some way in the future, however; current Mayor Tom Henry, who married Cindy Kocks in 1975, told Jimmy Kimmel that the city is looking into the possibility of naming something else after Mayor Baals. And what about just going with the second-place winner? Although it drew more than 2200 votes, it's out too; apparently the city council isn't interested in conducted business in Thunder Dome.